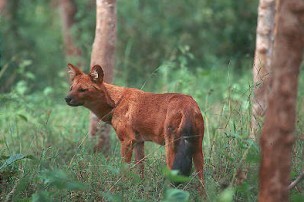 The Indian Wild Dog or Dhole is a member of the canid family but the only one of its genus, Cuon, in Asia. Much like a domestic dog in general appearance, it has a distinctive red coat with paler underbelly and a bushy black tail. Dholes live in packs that could have between 2 to 25 members or more, with a dominant alpha pair. 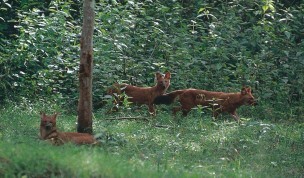 A Dhole pack is one of the most formidable entities one can encounter and their relentless pursuit of quarry, earned for them a thoroughly unjustified reputation as vicious killers. The fact of course is that they kill only to eat and no more. Wild Dogs are diurnal hunters, favouring the early morning hours and before twilight. Loss of habitat and disturbance is the main threat to the future of the wild dog. One of the most thrilling experiences in the Indian jungle is to follow a pack of Dhole as they quarter the forest on their daily hunts. A Dhole pack is one of the most formidable entities one can encounter and their relentless pursuit of quarry coupled with their need to kill on a daily basis earned for them a thoroughly unjustified reputation as vicious killers. The fact of course is that they kill only to eat and no more. Yet, the image of the gratuitous killers persisted and until fairly recently dhole faced concerted persecution. The Indian Forest Department even offered a bounty for them, evidence of the kills being provided by the tails of the animals. Despite this, the Dhole has survived and for the moment, appears to be holding its own. It has also been the subject of scientific studies, which have revealed a devoted parent and mate making a living in the way of all carnivores. The Dhole is a member of the canid family but the only one of its genus, Cuon, in Asia. It differs from the genus Canis (which includes wolves, jackals and domestic dogs) in having 2 molars instead of 4, and 12 to 14 teats as against 10. Much like a domestic dog in general appearance, it has a distinctive red coat with paler underbelly and a bushy black tail. Coat colour varies with season and locality. Historically the Dhole's range extended from Siberia to Sumatra. Like the Tiger, it is surmised that the Dhole must have entered India from the North-East and extended its range throughout the country and again like the Tiger, it arrived too late at the Southern limits of its range to enter and colonize Sri Lanka. In India, Dholes have been almost exterminated from the terai (foothills of the Himalayas), but its status seems to show little change in the Nepal terai, from where single, pairs or at the most three animals have been reported at regular intervals from the mid 1970s. Today, there are an estimated 15,000 of them in India and these exist in forested pockets in North-East, Central and South India. Wild Dogs are generally creatures of the forest, but being fairly adaptable also use scrub jungle and shola grassland wherever it is to their advantage. Food, water and shelter are their prime requirements and in this they resemble Tigers. However, they have also colonised the heights of Ladakh and Tibet and have adapted to the open terrain that characterises these arid regions. Dholes live in packs that could have between 2 to 25 members or more, with a dominant alpha pair. The pack is highly structured and there is much co-operation between individuals for activities such as hunting and breeding. Pack members co-ordinate while pulling down and killing large prey such as adult Chital (Cervus axis) and Sambar (Cervus unicolor). Across their range in India, Dhole show a preference for the most abundant prey species of that region. As such their prey includes a variety of species from wild sheep, Marmots, Hare and wild goat in Ladakh and the Himalayan regions to Chital and Sambar in the forests of Central and Southern India. Wild Dogs are diurnal hunters, favouring the early morning hours and before twilight. The prey is trailed by scent and pursued at sight in a steady, tireless canter which finally outruns the quarry. Observations in the field have shown that various strategies are used during hunting. Pack members have been observed jumping in and out of bushes, flushing out smaller prey hiding there. A single Dhole chasing a prey animal is helped by others who run at the quarry from different angles, reducing the distance between the lead Dhole and the prey. Sometimes, one Dhole overtakes the prey and confronts it from the front, causing it to turn around and flee right into the midst of the pack. the prey, weighing the animal down and biting off chunks. The animal dies of shock and loss of blood. Feeding on the prey is a generally equable affair and young pups within the pack are allowed to have precedence over others while feeding. Dholes usually kill at least once a day, though their hunts are not always successful. 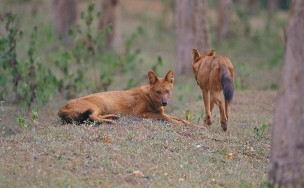 Studies in Mudumalai Wildlife Sanctuary (Tamil Nadu), have also shown that Wild Dogs tend to use the various hunting sites (generally specific areas where there are good congregations of Chital deer) within their territory on a rotational basis. This is because after the Dogs have been hunting in a particular patch for a few days, the Chital are in a heightened state of vigilance, making hunts more laborious and less successful. Tigers, Leopards and Dholes co-exist through much of their range in India. Scientific research has shown that despite the diet overlap, there seems to be greater aggression between Dhole and Leopards than between Dholes and Tigers. In many instances, a pack of Wild Dogs has got the better of and 'treed' a Leopard for an hour or more ! This is primarily due to the fact that Leopards and Dholes hunt prey of the same weight class, while Tigers killed prey of a higher weight class. Mating occurs between the dominant pair in October. Gestation period is about 2 months and the average litter size is 4-6. During the first month, the mother spends all her time with the pups suckling and guarding them. The rest of the pack goes hunting, not straying too far from the den, and brings back meat for the lactating mother. Den sites are frequently changed after the first 4 weeks and this could be for reasons of hygiene and to avoid predators such as Leopards or Hyenas. The other pack members also take part in the rearing of the pups. They regurgitate meat for them, groom and guard them, and indulge in a lot of play to improve their reflexes and alertness and prepare them for adult life. When sufficiently strong, the young go out on foraging expeditions with the parents watching and waiting, but not taking part in the action, while the adults make the kills. At 6 months they are ready to join the chase. Strict protection of Dhole habitats to maintain adequate prey base and surveillance to avoid poisoning of Dholes through live-stock kills. Fairly good in protected areas of South India and Maharashtra. Poor in Central India and North-East India due to large-scale depletion of prey base.